Mosaddegh, M., Esmaeili, S., Hassanpour, A., Malekmohammadi, M., Naghibi, F. (2016). Ethnobotanical study in the highland of Alvand and Tuyserkan, Iran. 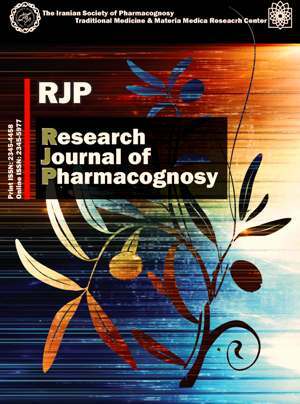 Research Journal of Pharmacognosy, 3(1), 7-17. M. Mosaddegh; S. Esmaeili; A. Hassanpour; M. Malekmohammadi; F. Naghibi. "Ethnobotanical study in the highland of Alvand and Tuyserkan, Iran". Research Journal of Pharmacognosy, 3, 1, 2016, 7-17. Mosaddegh, M., Esmaeili, S., Hassanpour, A., Malekmohammadi, M., Naghibi, F. (2016). 'Ethnobotanical study in the highland of Alvand and Tuyserkan, Iran', Research Journal of Pharmacognosy, 3(1), pp. 7-17. Mosaddegh, M., Esmaeili, S., Hassanpour, A., Malekmohammadi, M., Naghibi, F. Ethnobotanical study in the highland of Alvand and Tuyserkan, Iran. Research Journal of Pharmacognosy, 2016; 3(1): 7-17. 1Traditional Medicine and Materia Medica Research Center, Shahid Beheshti University of Medical Sciences, Tehran, Iran. Department of Pharmacognosy, School of Pharmacy, Shahid Beheshti University of Medical Sciences, Tehran, Iran. 2Traditional Medicine and Materia Medica Research Center, Shahid Beheshti University of Medical Sciences, Tehran, Iran. Department of Traditional Pharmacy, School of Traditional Medicine, Shahid Beheshti University of Medical Sciences, Tehran, Iran. 3Traditional Medicine and Materia Medica Research Center, Shahid Beheshti University of Medical Sciences, Tehran, Iran. Background and objectives: Medicinal plants are widely used by people in the treatment of various diseases. These resources are usually regarded as part of cultural traditional knowledge. The aim of this study was to identify the information about the medicinal plants used by indigenous people of some regions of Hamedan province, Iran. Methods: The present ethnobotanical study was conducted in the Alvand mountainous area of Hamedan and Tuyserkan. Interviews were done in 27 villages and totally 53 informants were interviewed. Ethnobotanical indices like relative frequency of citation (RFC) and cultural importance index (CI) were calculated. Results: Our study reports 80 traditionally used plant species, belonging to 31 plant families. Asteraceae with 12 species was the most used family in this area. The most used parts were aerial parts (18.57%), leaves (21.42%), and flowers (17.14%), respectively. The most treated ailments were digestive problems. The highest number of ethnobotanical indices RFC and CI were observed in Stachys lavandulifolia Vahl. and Thymus lancifolius Celak., respectively. Conclusions: Hamedan provincepossesses considerable knowledge about medicinal plants for treating common health problems. Goyal N, Sharma SK. Bioactive phytoconstituents and plant extracts from genus Heliotropium. Int J Green Pharm. 2014; 8(4): 217-225. El-Shazly A, Wink M. Diversity of pyrrolizidine alkaloids in the Boraginaceae structures, distribution, and biological properties. Diversity. 2014; 6(2): 188-282. Fu PP, Xia Q, Lin G, Chou MW. Genotoxic pyrrolizidine alkaloids-mechanisms leading to DNA adduct formation and tumorigenicity. Int J Mol Sci. 2002; 3(9): 948-964. Wiedenfeld H, Edgar J. Toxicity of pyrrolizidine alkaloids to humans and ruminants. Phytochem Rev. 2011; 10(1): 137-151. Chen T, Mei N, Fu PP. Genotoxicity of pyrrolizidine alkaloids. J Appl Toxicol. 2010; 30(3): 183-196. Ober D, Kaltenegger E. Pyrrolizidine alkaloid biosynthesis, evolution of a pathway in plant secondary metabolism. Phytochemistry. 2009; 70(15): 1687-1695. Khatamsaz M. Flora of Iran: Boraginaceae. Tehran: Research Institute of Forests and Rangelands, 2002. Akramov S, Shadmanov Z, Samatov A, Yunusov SY. Alkaloids of Senecio jacobea, Heliotropium acutiflorum, and H. transoxanum. Chem Nat Compd. 1968; 4(4): 221-222. Yassa N, Farsam H, Shafiee A, Rustaiyan A. Pyrrolizidine alkaloids form Heliotropium esfandiarii. Planta Med. 1996; 62(6): 583-584. Farsam H, Yassa N, Sarkhail P, Shafiee A. New pyrrolizidine alkaloids from Heliotropium crassifolium. Planta Med. 2000; 66(4): 389-391. Shafiee A, Salimi M, Farsam H, Yassa N. Pyrrolizidine alkaloids from Heliotropium dissitiflorum Boiss. DARU. 2002; 10(4): 168-170. Asibal CF, Gelbaum LT, Zalkow LH. Pyrrolizidine alkaloids from Heliotropium rotundifolium. J Nat Prod. 1989; 52(4): 726-731. Singh B, Sahu P, Singh S. Antimicrobial activity of pyrrolizidine alkaloids from Heliotropium subulatum. Fitoterapia. 2002; 73(2): 153-155. Jain SC, Sharma R. Antimicrobial activity of pyrrolizidine alkaloids from Heliotropium ellipticum. Chem Pharm Bull. 1987; 35(8): 3487-3489. Singh B, Sahu P, Jain S, Singh S. Antineoplastic and antiviral screening of pyrrolizidine alkaloids from Heliotropium subulatum. Pharm Biol. 2002; 40(8): 581-586.